The payment systems have restarted processing transactions made by cardholders at banks controlled by the Rotenberg brothers after it was established that the banks did not meet the criteria for sanctions. 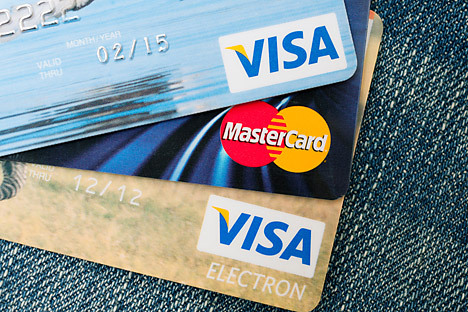 MasterCard and Visa have resumed services on client transactions on cards issued by banks controlled by billionaire brothers Arkady and Boris Rotenberg, following acknowledgement that there was no legal basis for blocking transactions to these banks according to U.S. law. On March 21, the international payment systems had blocked transactions on MasterСard and Visa cards held by account holders of SMP Bank and Investcapitalbank, both controlled by the Rotenberg brothers, who feature on the U.S. sanctions list drawn up in response to Russia’s annexation of Crimea. However, just two days later it turned out that, under U.S. law, there were no grounds for blocking the banks' operations. Confusion over how the sanctions are to be applied is likely to primarily benefit lawyers in Russia and the U.S., who will now be checking all transactions in Russia with extra care. On Thursday, the Rotenberg brothers, together with several other Russian officials and businessmen with close links to the Kremlin, were placed on a U.S. blacklist singling out 20 persons to be subjected to sanctions. On Friday, sanctions in relation to the banking assets under their control were implemented by the two international payment systems, whose headquarters are in the U.S. However, just two days later, on March 23, the sanctions were lifted for several banks. "Visa has restored access to its network for SMP Bank, Investcapitalbank and Investitsionny Soyuz (Investment Union) Bank, having been notified that these financial institutions do not meet the criteria under which the U.S. Treasury introduces economic sanctions," the company said in a statement. Experts point out that "control" is the key word when trying to understand why the sanctions against the Rotenberg brothers were lifted. "This has to do with the share the individuals affected by the sanctions own in the banking assets," explained a source familiar with the situation. "The sanctions should be introduced in relation to assets in which individuals from the sanctions list have de jure control, i.e. a share of more than 50 percent, which is not the case with SMP Bank and Investcapitalbank," another source told Kommersant. According to available data on the banks' ownership structure, Boris and Arkady Rotenberg own 38.05 percent of shares in SMP Bankand 40 percent in Investcapitalbank each. In other words, neither of them personally has control over the banks, they have control only together, as part of a group of individuals. The notion of control through a group exists in general U.S. law, but not in sanction law. "Sanction law in the U.S. is a special type of federal legislation that does not envisage the use of concepts that exist in other branches of American law, for instance in the case with a group of individuals in anti-monopoly law,” explains Denis Uzoikin, a partner with the Moscow-based law firm Uzoikin, Piskov and Colleagues. "Sanction law deals with 50-percent control by a specific individual subjected to sanctions, that is why the idea of control by a group of individuals is in this case not applicable," says Uzoikin. To what extent the situation with the sanctions put in place was an accident is another matter. "On the one hand, everybody can make a mistake, on the other, one cannot rule out a certain political pressure," he added. Military sanctions against Russia: Who is the real loser? The banks are already calculating their losses caused by the sanctions: immediately after the sanctions were lifted, clients of SMP Bank withdrew 3 billion roubles ($83 million) from deposits and 1 billion roubles ($27.4 million) via plastic cards. As of March 1, SMP Bank and Investcapitalbank had some 80 billion roubles ($2.2 billion) and 10 billion roubles in individual accounts, respectively. It is not yet clear whether the banks controlled by the Rotenberg brothers will seek to recover losses incurred by the sanctions. "They would have to prove their case in an American court, which, given the current political situation, may turn out to be not easy," Uzoikin pointed out.